Canada is celebrating its 150th anniversary in 2017. Food festivals, music festivals and even more food festivals. When it comes to tourism, Canada has become quite the draw. Considering the long, harsh Canadian winter, it's no surprise that summer is embraced with open arms. Festivals give Canadians a platform to come together and enjoy the warm weather. Even international tourists are making the trek to the Great White North. According to the Calgary Herald, Canada welcomed 20 million foreign visitors in 2016 alone. When The New York Times released its top destinations for 2017, Canada ranked first. Coupled with Canada's 150th anniversary, there is clearly opportunity to pump up the tourism sector this year. Festivals can act as a perfect marketing tool for tourism. A tangible event for tourists to look forward to and plan their trip around can not only boost the economy but also make for a more enjoyable trip for the tourists. In fact, 10 per cent of festival-goers are already coming from out of country. 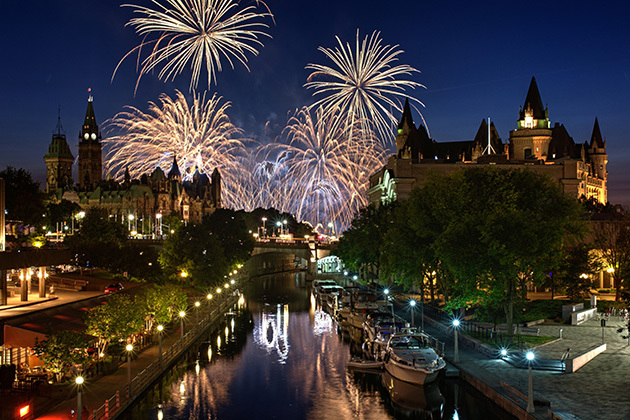 The power of a tangible event can be felt no more powerfully than through the rubber duck controversy surrounding this year's Canada Day celebrations. Taxpayers were enraged after learning about the government spending $120,000 to rent a giant rubber duck over the Canada Day weekend. However, once the celebrations kicked off hundreds of thousands of people came down to Toronto's harbour front to catch a glimpse of the giant rubber duck — making restaurants and hospitality providers happy. Having something to look forward to can really boost tourist turnout, and those effects ripple throughout the hospitality and tourism sectors. Yet the Canadian festival scene has been suffering. In British Columbia, three prominent music festivals — Pemberton Music Festival, Squamish Valley Music Festival and Victoria's "Rock the Shores" — were canceled in the past two years. The CBC outlined two major explanations for this concerning trend: a low Canadian dollar and near-infinite choices available to festival-goers. These two factors intertwine, making it difficult to book competitive headliners — a major pull in getting people to consider the festival in the first place. However, music festivals aren't the only ones to be hit. Emerge Yoga, an Ontario yoga festival that was once hailed as a "must experience" event by Expedia, recently declared bankruptcy only days before the festival was scheduled to take place. Food festivals aren't safe either, as Sudbury's decade-long Garlic Festival was canceled due to overwhelming competition. Clearly, something needs to be done for Canadian festivals — and that might mean a little support from the government. The Canadian Heritage and Economic Development agencies currently support 4 per cent of the festival sector. This number is meager in comparison with other developed nations. The British Arts Festival Association receives a public revenue share of roughly 28 per cent, and the state of Texas invests $40 million for various events. In response, Canada's Festivals and Major Events (FAME) is asking the federal government to step up and help promote tourism through investments into festivals. But critics against government support can simply point to this year's turnout to the North by North East (NXNE) festival in Toronto. Having received $300,000 in funding from the Ontario government this year, NXNE was expected to be a hit. In reality, the three-day-long festival was a bust — highlighted by an eerily empty fair ground. After witnessing the failure of such a well-funded music festival, it can be easy to quickly turn your back on festivals altogether. However, many festival-goers pointed to a number of reasons for the low turnout rate, including a change in venue and a number of competing festivals held on the same weekend including Pride, Toronto Jazz Fest and Luminato. It's important to take these other factors into consideration. Overall, it seems that festivals act as an opportunity to market Canada as a tourist destination. With funding into the right types of festivals and a determination to overcome some of the obstacles that are inherent to the sector, it seems that festivals have a real potential to give everyone a memorable summer — Canadians and tourists alike. Sabrina Fracassi is a content editor intern working with MultiBriefs for the summer of 2017. She is currently pursuing a degree from Western University in international relations and will be going into her fourth year in September. During the school year she works as an editor for her school newspaper, The Gazette, and volunteers in the London community.